THE earliest records of the people- we now call ngoni people appear in scattered Portuguese records from the sixteenth century onwards. In 1606, Dos Santos described a fierce, warlike people whom he described as Mumbos and Zimbas on the north bank of the Zambezi River opposite Sena and Tete. There are other records which show that these same people were on the Zambezi River in 1570, 1575, 1589 and 1592, and some authorities believe that they had been resident in the country between Lake Malawi and the lower Shire River Valley near Lake Cilwa until about 1550, when they started to move south. The Mumbo, or as we now know them, the abaMbo or aMbo or uMbo lived according to this account on the west, and the amaZimba or aZimba immediately on their east. They were closely allied divisions of one tribe. We have now no record of why they moved, but we can assume that one thing only, war, moved them, and the only people who could possibly have moved them was the horde of the aMaravi moving at about that time down the valley of the Shire River and the hills and streams between Lake Malawi and the valley of the Luangwa River. The aMaravi have considerable tradition of meeting not only pygmy aKafula on entering what is now Malawi, but also a tall, cattle-owning people whom they called the baKatanga. The aMaravi pushed both these peoples before them and eventually across the Zambezi River, with the exception of remnants of the baKatanga who are to this day found in Portuguese East Africa and Zambia under names such as baPule, aZimba, etc. According to Soga, these amaZimba and abaMbo were, at the time that they reached the Zarnbezi River, a patrilineal people with a system of a great house and a right-hand house, as is universal among the abeNguni, amaLala and abaMbo in South Africa to this day. The amaZimba and abaMbo attacked the Portuguese stations on the Zambezi River in 1570 and nearly annihilated them, and the Portuguese recorded that a large part of the. host crossed the Zambezi River in 1575. although there is no doubt at all that there were many crossings by portions of these people before that. The portion which crossed the river in 1575 consisted almost entirely of abaMbo with only a small proportion of amaZimba. In 1585, the advance guard of the main amaZimba host still left north of the Zambezi River crossed the river and fought a pitched battle with the Portuguese, and was severely defeated, owing to their foolish occupation of a defensive position in a thorn bush stockade which offered no protection against the Portuguese guns. The remnants of this advance guard recrossed the river to the north bank and rejoined their fellow tribesmen there. They combined forces and moved eastwards down the Zambezi valley seeking vengeance against any Portuguese they might find. They invested Mozambique which was situated on an island, and destroyed all works connected with the Portuguese which they could find on the mainland. Failing to capture Mozambique, which they could not reach, they then moved north-wards up the coast towards Kilwa, which was then a Portuguese settlement, and on reaching Kilwa destroyed it and annihilated the garrison there. They then moved on up the coast towards Mombasa and on arrival there attacked the Portuguese, but were unable to capture their forts, and so moved on towards Malindi, where they were signally defeated by a combination of the Portuguese with a large band of the local inhabitants of the surrounding country. The amaZimba were now greatly reduced in numbers through frequent fighting, and turned back and retraced their steps southwards through the country they had already devastated, and eventually reached the Zambezi valley and settled down and eventually disintegrated there. Their present-day descendants, the aZimba, are noted as brave and skilful elephant hunters. In 1616, Gaspar Bocarro travelled from the Zambezi River overland to Kilwa, and on approaching the coast south or Kilwa reported the country as "devastated" by the Zimba. When the amaZimba first settled on the Zambezi River on their return from the north, they set about consistantly attacking any allies of the Portuguese near Quelimane, making it almost impossible for the Portuguese to obtain any food. In order to drive off the amaZimba, the Portuguese sent reinforcements from Tete. In the subsequent engagement, the Portuguese were severely defeated by the amaZimba led by their chief Ntondo, and as it result of this defeat agreed not to interfere with the amaZimba in any way in their activities against the other African tribes, and the amaZimba in return agreed not to molest the Portuguese. Until the 18th Century, the Portuguese held their stations in the vicinity of the amaZimba only on sufferance by that tribe, and their authority did not extend more than a few miles from their trading posts. As a tribe, the amaZimba has now largely disappeared. It is probable that with slack living and the taking of numerous slaves, the tribe slowly disintegrated as such. At the present day, the aZimba elephant hunters live in small family groups here and there among other tribes, and there are small groups of them in the southern part of Malawi descendants of wandering elephant hunters who settled there between 1850 and 1870 in order to escape the exactions of the Portuguese slave raider known as Matakenya. At the end of the 16th Century, the Portuguese record showed the "Bassonga" as living opposite Tete on the north bank of the Zambezi River. Some authorities have identified the Bassonga with the Nsenga, who are a division of the aMaravi tribe, but it is probable that the aNsenga did not take that name until much later. However, whoever the Bassonga may have been, it is likely that they were a part of the host which drove the amaZimba and aBambo down and across the Zambezi River. When Bocarro travelled through Malawi in 1616, he named streams and places which are known to this day, and he referred (in their wrong context) to "Nyanja" and "Mang'anja", thus clearly demonstrating that the present inhabitants of Malawi were then in occupation of the country. Some fifty years later, Kalonga and Lundu, two of the greatest chiefs of the aMaravi were actually named in a Portuguese document and the tribe described as Maravi, and there can be little doubt that it was the aMaravi who drove out the amaZimba and abaMbo from what is now Malawi. The abaMbo, as already stated, crossed the Zambezi River in 1575 and on other occasions at about that time, together with a part of the amaZimba tribe. Most of these amaZimba stayed on the south bank of the Zambezi River until defeated by the Portuguese, when the survivors returned to the north bank of the river. The abaMbo, however, did not delay at the Zambezi River. Having crossed the river, accompanied by a portion of the amaZimba tribe, they moved up into the higher country to the south, and settled for a few years under an abaMbo chief named Souza between the Sabi and Limpopo Rivers in order to grow crops. Finding themselves too near the powerful maKaranga kingdom of Munumutapa, and the soils of the area where they settled too poor and the rainfall too erratic, they moved on again and by 1620 had reached Natal. Meanwhile, other groups of amaZimba and abaMbo had moved direct through the country occupied by the baTonga and had probably already reached and settled along the seaboard of Natal which they found then occupied by the pygmy baTwa and the click-speaking Bushmen. While in the country of the maKaranga, the host of Sonza incorporated large numbers of amaKaranga into the abaMbo tribe, and also annexed maKaranga cattle. Perhaps it was here that they began to absorb the Bushman click in their language through incorporation of the Bushmen peoples they first met south of the Zambezi River. Once settled in Natal, the amaZimba and AbaMbo rapidly incorporated the pygmy and Bushmen peoples they found there and in doing so incorporated the three clicks that today occur in their language. The aZimba who remained north of the Zambezi River have no click in their language. In 1589, Manoel de Faria e Sousa described a tribe he called the Virangune as inhabiting the country inland from Delagoa Bay. These were part of the amaZimba host who did not tarry at the Zambezi River nor accompany Sonza, but had moved direct through the baTonga country to Natal, and were probably at that time still moving south, but they may equally well have been the amaZimba division of the abaMbo host of Sonza which had already separated under their chief Nguni, as the name Virangune or amaNguni would appear to make the more likely. In about 1620 the abaMbo arrived in what is now the Wakkerstroom district of Natal. The abakwaXhosa or amaXhosa are said to have settled on the Dedesi stream, a tributary of the Mzimvubu River, at that time. In about 1650, the abaMbo moved down the Mzimvubu River to its mouth, where Port St. Johns now stands. It is said that the amaXhosa were being called by that name at the time they settled at the Dedesi stream, and that Xhosa was the grandson of Nguni, the Nguni to whom Manoel de Faria e Sousa referred in 1589 when he referred to the Virangune-the people of Nguni. From that time the abeNguni of the amaZimba tribe became known as amaXhosa after the chief Xhosa, who is remembered to this day as the greatest of their chiefs, since it was under Xhosa that the tribe finally settled and expanded into a well-knit tribal unit after the years of wandering. It is unlikely that the name was originally Xhosa. The click was probably incorporated later and the name altered to suit the new pronunciation. The amaKaranga incorporated into the abaMbo tribe of Sonza and his amaZimba satellites during their stay in the maKaranga country have given rise to the present-day amaLala, and many of the clan names of the amaLala are those of the amaKaranga. In 1686, the survivors of a wrecked ship named the Stavenisse travelled along the coast until they reached European settlements. They found the chief of the amaXhosa people to be Togu, and using this as a date to fix Xhosa genealogy, there are some who ascribe the chieftainship of Xhosa to be about 1535 and that of Nguni to 1510. African unwritten genealogies are notoriously inaccurate, and it is more probable that this Nguni was the amaZimba leader with the abaMbo migration, and that Xhosa was born after the crossing of the Zambezi River. Nguni is traditionally the first chief of what is now the abeNguni division of the Zulu-Xhosa peoples, and there is no doubt that it was Xhosa who led them when they settled on the Dedesi stream. Under pressure from the abaMbo and what are now the amaLala peoples, that is, the maKaranga peoples incorporated by the abaMbo in their journey south, the majority of the amaXhosa peoples as they at that time called themselves move south out of Natal. A few stayed behind and became allied or kin to the abaMbo and amaLala peoples. The people who were welded early in the 19th Century into the amaZulu nation by Shaka were amaLala, but in the area of the people now known as amaZulu there were also a people called abeNguni. These were the descendants of the amaZimba of Sonza who had not moved with the amaXhosa, and retained the original name of abeNguni. Perhaps, from the fact that they used the name abeNguni and not amaXhosa, there was already a division in the tribe before the amaXhosa moved off out of Natal. The abeNguni retained the isibuliso or isikahlelo of the amaXhosa peoples and did not adopt the isithakazelo of the amaLala and abaMbo peoples. It is said that this Royal Salutation is often the key to tribal affinities among the tribes who use it, whereas the isibongo or clan name is not so reliable. According to their isithakazelo, the present-day amaZulu are amaLala in origin, and the present-day tribes of Natal other than the amaZulu are amaZimba in origin. The abeNguni use the isithakazelo Mnguni, following amaLala custom which they adopted at some time after their separation from the amaXhosa, but the amaXhosa use the isibuliso naming the reigning chief. When the abaMbo and amaLala settled in Natal, they were a reasonably unified people, as any people recently coming through a mass migration would be. Soon after they settled in Natal, the tribes began to break up into separate chiefdoms, as did also the amaXhosa who had moved further south, until, at the beginning of the 19th century, there were many tribes or divisions of each great tribe, each warring against one another and owing no allegiance to any common leader, yet one people in blood and language and customs. In about 1785, or according to other accounts perhaps as late as 1793, there was born near the Tugela River in Natal a child whose origin was reputedly miraculous. His father was Senzangakona, and his mother Mnandi (the pleasant one.) His mother, fearing for the life of her child because Senzangakona had decreed the death of all male heirs, fled with her child to the protection of a more powerful chief named Dingiswayo, chief of the amaMtetwa, and a relative of her family. Here, under the shadow of Dingiswayo, grew up the boy who was to be given the name of Shaka (the intestinal parasite). He was received and cared for as a son of Dingiswayo, and his mother Mnandi stayed with him. At that time, Dingiswayo was the most powerful chief between Natal and Delagoa Bay (the modern Lourenco 'Marques). On gaining the chieftainship of his tribe, Dingiswayo had organised his tribe into regiments, which in turn were organised into companies, platoons and sections on the European model, and he divided his regiments, the terrible impi, into regiments of young men and regiments of seasoned warriors. When he grew up, Shaka wall given command of an impi, and soon gained great prestige as a warrior. The only known contemporary portrait of Shaka Zulu. Scholars however dispute the length of the shield and spear. Zulu spears were much shorter this time due to Shaka's innovations. There are two stories to account for the rise to power of Shaka. One account is that on the death of Senzangakona, the father of Shaka, Shaka claimed the chieftainship, but was not supported by his patron Dingiswayo who supported the legitimate heir, Mfagazi, the eldest son of the chief wife of Senzangakona, and a half brother of Shaka. Shaka never forgot this, and a few years later when Dingiswayo was engaged in war with Zwide, Nqumayo or Nxumalo of the abakwaNdwande tribe and abakwaNxumalo clan, Shaka deserted with his regiments to Zwide, and together with Zwide, Shaka fell upon Dingiswayo and in the ensuing battle in 1818, Dingiswayo was defeated and died shortly afterwards. The other and more likely story is as follows. Dingiswayo had for some years measured his strength with Zwide in a series of inconclusive battles, although in the majority of these engagements, Zwide had come off worst. In 1818, however, Zwide made a surprise raid on Dingiswayo's village and captured Dingiswayo himself and carried him off to his village where Dingswayo died a few days later. Shaka, racing with his regiments to the support of his patron Dingiswayo, arrived too late to save him, but just in time to take command of the now fully mustered but leaderless regiments of the amaMtetwa of Dingiswayo. The combined forces now fell on the amaNdwande of Zwide and after a bitter battle defeated Zwide but not sufficiently conclusively to crush him. After a series of engagements, lasting over a period of several years, Shaka gradually mastered Zwide and piece by piece drove out his followers from Natal. Whatever the true story, Shaka seized the chieftainship of the amaMtetwa, although he had no traditional tribal claim or title to it, and through sheer personality and the loyalty of his own regiments, he consolidated himself in this position. Under Dingiswayo, Shaka had ample opportunity of studying the art of war as developed by the amaMtetwa. He now set out to improve on it. Shaka believed that to spare human life was fatal to success. He believed that utter extermination of an enemy was the only method to ensure that that enemy did not rise again. He believed that the only way to ensure that extermination was to ensure close combat. To this end, he introduced the use of the large shield and the stabbing spear, and to ensure unquestioned obedience to his orders, he gave out the most stringent commands against cowardice or disobedience. When Shaka took over command of the amaMtetwa, they were well organised militarily, but they were armed in the traditional way with throwing spears. In order to prove to his warriors the superiority of the broad-bladed stabbing spear over the throwing spear with its long narrow blade and long light shaft, it is said that Shaka called out one hundred of his best warriors, and, arming half that number with the ordinary implements of war as used in those times, he armed the other half of that number with one throwing spear each, but broken in half in the shaft, and a shield of ox hide. The opposing parties were placed about one hundred yards apart, the range of a skillfully-thrown spear, and he gave the order that fighting should continue until every man on one side was killed. The men armed with throwing spears, from four to six spears each, threw them at their enemy who parried the spears on their shields, quite forgetting that they would have none to gather, because none were thrown at them, and they could not rearm themselves as was the usual custom. The result was that they were soon unarmed, and the men of the stabbing spear rushed in and killed everyone of them. Zulu warriors before the Anglo Zulu War in 1879. With Shaka, the history of the Angoni of today begins. As he gathered strength, Shaka attacked and defeated tribe after tribe, reserving to the last his most powerful enemy and neighbour Zwide. Meanwhile Zwide, seeing the military development of the amaZulu, as Shaka called his people, had adopted the same armament.Eventually Shaka and Zwide met in final battle. Zwide had under him several friendly tribes, among whom were the abeNguni, of one-time Xhosa stock as already described, led by uZwangendaba whose name means "hear by report". In this battle in 1821 or 1822, Zwide was utterly defeated and he and his son Sikunyana were killed, owing partly to the last-minute defection of a part of his forces under a traitor named Noloja. uZwangendaba, son of Mbekwane, of the Kumalo division of the abakwaNxumalo clan, and Shongonane, son of Gasa, of the abakwaNdwandwe clan, together with other lesser chiefs, deciding that the situation "would not rear them any calves", marshalled their people, and fleeing from the terrible vengeance of Shaka which they knew would follow, determined to get as far way from Shaka as possible. They cut their way through the amaNgwane and other tribes in their path and fled to the north. Zwangendaba had been an ally rather than a vassal of Zwide, and shortly before Shaka fell upon Zwide, Zwide was in fact about to attack and destroy Zwangendaba, and tradition still records how Mtombozi, the mother of Zwide, disrobed in front of the warriors, and, standing naked before them, admonished Zwide with the words "would you destroy the abeNguni who succoured you before?". This unusual act, savouring perhaps of witchcraft, forced Zwide to desist from attacking his ally. This incident is widely quoted to show that at that time the people of Zwangendaba were known as abeNguni. Fleeing northward and taking with him as many women, children and cattle as he could muster, Zwangendaba strove to get away from reach of Shaka. Shongonane, also known as Sochangane, and nicknamed Manukuza by which name he was known to the Portuguese, fled side by side with him. The people through whom they passed called them vaTwa, the people of the clicking tongue, after the name their forefathers had applied to the Bushmen, and long before that to the pygmies. Shongonane was a nephew of Zwide and his following was a mixed following of amaNdwande and also amaMtetwa and other fugitives from Shaka. Zwangendaba halted first on the Pongola River, and then pushed on again to get away from Shaka, falling upon the amaTonga in his path and cleaving a way through them on his way to the north where he reached the sea at Lourenco Marques. In 1826 or 1827, Zwangendaba and Shongonane jointly defeated the Portuguese at Lourenco Marques and then moved on again to the north. They crossed the Nkomati River near where there is now a station of the Basel Mission, and at this place Nqaba Nqumayo, sent by Shaka, caught up with them. The force of Nqaba had just about reached its limit through fever and hunger, and Zwangendaba was able to beat off the attack. Not daring to rest as long as Shaka could reach him, Zwangendaba decided to move on again, and turned to go west to join Mzilikazi. Mzilikazi, son of Machobane or Matshobana, of the house of Kumalo of the abakwaNxumalo clan, was born in Zululand in about 1798, and in due course he had become an important and trusted general of Shaka. Following a successful marauding expedition in about 1820, in which he gathered large numbers of cattle, and having in recent years become increasingly afraid of Shaka decided to desert with the loot. Accompanied by large numbers of followers, Mzilikazi fled west into the Drakensberg Mountains. Here the revenging regiments of Shaka caught up with Mzilikazi and soundly defeated him, capturing most of the cattle. Moving further west into the mountain passes, Mzilikazi beat, off further Zulu attacks and pressed on into Basutoland where Moshesh reigned at Thaba Bosigo. Defeated by Moshesh, Mzilikazi withdrew into the "inyoka" country of Basutoland and settled there for a while. While Mzi1ikazi was here, the name amaNdebele, derived from the word tebele meaning "a foreigner" was applied to his people by the baSuto and adopted by them. Finding himself not yet secure from Shaka's regiments, Mzilikazi moved on again and settled in the Marico Valley, not far from the modern. city of Pretoria. Zwangendaba had not been happy in the fever-ridden low country of the Limpopo valley, and when he decided to move west to join Mzilikazi, it was in order to get into the hills as well as to escape from Shaka. Shongonane refused to accompany Zwangendaba to the west, but Mhlaba wished to accompany Zwangendaba. Mhlaba and Shongonane were sons of Gasa, youngest son of Langa, son of Ndwande. Gasa was a younger brother of Zwide, and Mhlaba and Shongonane were thus therefore both amaNdwande and not abeNguni. 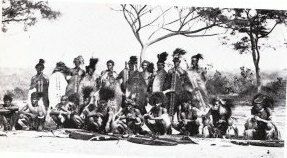 The following of Zwangendaba had first contacted the amaTonga in 1823, and during the few years that they resided among and conquered the surrounding amaTonga, they incorporated large numbers of this vassal tribe into their regiments, and their women into their families. The force that had fled from Shaka numbered perhaps only a few thousand men, with a small proportion of women and children. As more men and women were added from among the amaTonga and other tribes through which they passed, the number of the abeNguni, as they called themselves, grew considerably. This already polyglot horde of Zwangendaba turned up into the hills to the west towards Mzilikazi, with whom Zwangendaba hoped to join forces. He did not meet with the reception he desired. Perhaps Zwangendaba attacked Mzilikazi or perhaps Mzilikazi, jealous of the threatened competition, attacked the approaching Zwangendaba. We do not know. In any event, Mzilikazi and Zwangendaba clashed, regardless of their relationship, and Zwangendaba was defeated, and decided to move north of the country dominated by Mzilikazi. Crossing the Limpopo River, Zwangendaba found himself in the country of the baNyai. Attacking the great chief or Mambo of the baNyai, named Rupengo or Sabanga, also known as Chirisamuru, in his stone-built fortress at Dhlodhlo on Thaba-si-ka-Mambo, Zwangendaba hemmed in the baNyai in the ancient stone fortress which they had occupied, and defeated them with great slaughter, capturing Rupengo alive and a few days later having him skinned alive. This was in about 183l. Zwangendaba then settled down in the country which he had conquered. Meanwhile, Shongonane had also moved. 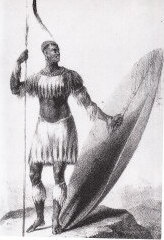 A large expedition had been sent against him in 1828 by Shaka, and although this expedition reached no further north than Inhambane where it was forced to turn back because of hunger and fever, Shongonane now decided to move further out of range of Shaka's regiments, and turned west up the Sabi River. In 1833, Shongonane had sacked Inhambane, and his move into the interior must have been in that year or in 1834. As Shongonane moved up the Sabi River, he approached more and more closely to Zwangendaba, who became uneasy at his approach, remembering his clash a short while before with Mzilikazi, until, at the headwaters of the Buzi River, the two forces met and immediately joined in battle. Zwangendaba was defeated and immediately moved out towards the north.Entering what is now called Mashonaland, Zwangendaba clove a broad path through the maKaranga until he found himself once more among the amaTonga and kindred tribes in the valley of the Zambezi River. To the Portuguese, Shongonane was known as Manukosi or Manukuza. On his death, he was succeeded by Umzila, who in turn was succeeded by Gungunyana who was deposed by the Portuguese in 1896. To Africans, the following of Shongonani are known as abaGasa, but to Europeans they are more popularly known as Shangaans. Late in 1835, Zwangendaba reached the Zambezi River somewhere between Sena and Tete and commenced preparations for crossing the river. On 20th November, 1835, in the season of chiganyane, when the Zambezi River was at its lowest at the height of the dry season, Zwangendaba crossed the Zambezi River, at a place selected by the Gama clan. Mhlaba, or as he is sometimes known, Nqaba, decided not to cross the Zambezi River, and remained on the south bank, soon to raid the Portuguese and remind them of the terror of the name of the amaZimba of two and a half centuries earlier. Moving downstream past Tete, Mhlaba settled between Sena and the mouth of the Zambezi River, and set about subjugating the• baTonga of that neighbourhood. They then attacked and sacked Sena, driving the Portuguese survivors onto an island in the Zambezi River after 54 of their number had been slain in Sena. They then permitted the Portuguese to return to Sena on condition that they paid annual tribute to them, and to this the Portuguese were forced to agree. As late as 1863, Sena and the Portuguese prazos on the lower Zambezi River paid regular annual tribute to the successors of Mhlaba whom they styled Landeens or Zulus. Mhlaba became known as Mhlabawabaduka from the fact that he separated from Zwangendaba. There are many picturesque stories of the crossing of the Zambezi River. Tradition records that Zwangendaba struck the waters with a stick and that they parted and he crossed over dry shod. This is a common legend from perhaps before Biblical times to describe the crossing of water in a canoe or boat by people unaccustomed to and afraid of water, as the aNgoni are to this day. Zwangendaba himself and some of his closest relatives were ferried across the Zambezi River by Kanyimbwa, an Nsenga headmen, who was willing to ferry him across somewhere to the west of the main army crossing. Twenty five years later, Dr. Livingstone found Kanyimbwa still resident at the same site. The main host crossed by the following means. The warriors waded into the stream with linked arms until the living chain had reached to the further bank. Nowhere was the water deeper than waist deep. The women and children then crossed above the chain, being supported by it. Most of the host had crossed the river when the chain broke, due, it is said, to the mass of water which piled up against the human barrier. With the breaking of the chain, many of the men were swept away and drowned, for none of the aNgoni could swim. Mputa Maseka had been detailed to form the rear guard at the crossing, and to bring over the cattle, donkeys and goats of the aNgoni. When the chain broke, he feared to cross, and those men, women and children who had not yet crossed were forced to join his rearguard. Zwangendaba could not wait at the river for Mputa, neither could be compel him to cross, or even to punish him for disobedience. Zwangendaba was therefore forced to move off to the north without his livestock, all of which were left on the south bank of the Zambezi River with Mputa. The exact date of the crossing of the Zambezi is known, for while the crossing was in progress, there occurred a total eclipse of the sun, a fact variously interpreted by the tribal soothsayers to mean either disaster or great fortune to follow. Having crossed the Zambezi River, and moved on to the north, Zwangendaba now found himself among the peacable Nsenga peoples of the Luangwa Valley, a branch of the aMaravi tribe. There are some authorities who estimate that when Zwangendaba fled from Shaka, he fled with no more than perhaps two thousand warriors and but few women, and that, through incorporation of conquered tribes On the way, he reached the Zambezi River with a host that numbered not less than twenty thousand spearmen and perhaps a total of one hundred thousand persons of all ages and sexes. We have now no knowledge of the strength of the tribe when it crossed the Zambezi River, but it must have been considerable as its subsequent history shows and as the proportion of clan names of conquered and assimilated tribes indicates. Mputa, finding himself alone on the south bank of the Zambezi River, probably in 1836, abandoned the livestock, which in any event was probably dying from animal trypanosomiasis, and crossed the Zambezi River by means not now recorded, and struck out towards the north up the valley of the Revubue River, somewhat to the east of the line taken by Zwangendaba. Arriving on the high upland plateau of the treeless grasslands round Domwe Mountain, west of the modern Dedza Boma, Mputa decided to settle and raid the surrounding aMtunda, a section of the aMaravi tribe. However, he had no sooner settled down than he heard that Zwangendaba was settled only a few days march to the north west, and fearing the reprisals that Zwangendaba was sure to deal out to him for failure to rejoin the main host and for failure to bring the livestock, Mputa decamped hastily to the east, taking with him what persons he had captured and also the cattle he had collected round Domwe. Finding his further progress barred by Lake Malawi, he turned south along its shores and eventually reached the Shire River at the point where the village of Chief Mponda now stands at Kaya. Here he found the reigning Kalonga of the aMaravi, named Sosola or nicknamed Kalimapadzuwa, in control of all means of crossing the deep and unfordable Shire River. Bribing Kalonga Sosola with all the cattle he had with him, Mputa crossed the Shire River in canoes paddled by the men of Kalonga. Striking straight up east into the hills fringing the eastern side of the Shire River, Mputa then turned north and travelled up the high country along the divide between waters flowing to Lake Malawi and those flowing into the Rovuma River. Crossing the Rovuma River among its headwaters, Mputa found himself in the cool uplands of the cattle-owning and peacable aMatengo tribe, east of the north end of Lake Malawi, near where the modern station of Songea stands, and here Mputa decided to settle and raid the surrounding countryside and make good his deficiencies in cattle. Mputa was known also by the nick-name of Mungwala, and his people soon became known as amaMungwala, later corrupted by the tribes they raided to amaMangwara and Mangwangwara. It is seen how Zwangendaba had turned from each contact with the fierce Zulu-trained peoples with whom he clashed, each time seeking an opening to a peaceful land where he could raise cattle and live the traditional life of the Zulu-Xhosa peoples, as a despot and owing allegiance to none, where his young men could "wash their spears in blood", and where the thunder of the royal "Bayete" and the drumming of the spears on the shields of massed regiments would swell the chiefly heart. While Zwangendaba fought with Shaka or Shongonane or Mzilikazi, he fought with equals or betters in the art of Zulu war. It was the spirit, training and discipline of the Zulu armies which counted. The regiments containing the manhood of the peaceful amaTonga, baRozvi, amaKaranga and other tribes were no match for the purer and better disciplined Zulu tribes. The regiments of Zwangendaba were trained and fought in the Zulu ways of war. The traditional attack was the crescent in a form like the head of a bull, with the right horn and the left horn to envelop the enemy while the broad weight of the forehead carried the weight of the main attack. The traditional time for an attack was at the very first light of morning, "when the horns of the cattle rise out of the mist". The regiments were trained to go on long forays without any baggage at all, driving with them herds of cattle and later, when they reached their raiding grounds, subsisting on the meat of the cattle they captured. As Shaka had said, so also Mzilikazi and Zwangendaba said "a man can not be cold when his belly is full of meat". A child was born to a regiment. As soon as he was old enough to herd cattle, he spent all day in the bush with the cattle and in the evenings squatted on the outskirts of the men taking their meal at the gates of the cattle kraal, listening to their talk of war and the stories of prowess of the regiments. As he grew older, he was drafted into his regiment and was taught the parry with the large ox-hide shield, the upward thrust of the stabbing spear, how to throw the one throwing spear-the mcowa-that was allowed him, how to throw a throwing stick with the underarm throw that would hit with unerring accuracy a target forty yards away. At the age of about seventeen or eighteen years, he was circumcised, and forced to go through the rites which taught absolute obedience and self reliance. He was now fit to join his regiment when it went to war, as a member of a well-knit and well led fighting machine. His regiment carried distinctive shields for no two regiments carried shields of the same colour or colour pattern. His regiment was a regiment of majaha, the young unmarried men. After some years, perhaps not until he was thirty years of age, he received the right to wear isidhlodhlo, the head ring, but only after he had proved himself in war. With the right to wear the head ring, he was allowed to marry and was granted cattle from the royal herds. He now joined one of the regiments of amadoda, the old men, known as ankehla, the ringed men. When Zwangendaba entered the country of the amaTonga, baRozvi and amaKaranga, he met a people who fought with the throwing spear and the bow and arrow, who had no compact military organisation, and who could not swing great armies into battle at a few days notice. He incorporated large numbers of these alien matrilineal people into his tribe, and by the time he reached the Zambezi River, already his regiments were getting "soft" and the Zulu discipline declining. Even so, the absolute superiority of the shield and stabbing spear was still to cleave a wide path among the peoples who to this day talk of a "war" as an action which lasted perhaps several days, between people sniping at one another from behind trees with their bows and arrows, and who counted a single death among the enemy as a great event. Until he crossed the Zambezi River, Zwangendaba was moving away from the other people of the stabbing spear. Now the urge to move was the urge to find cattle and a cattle country, where "they could rear calves" in more ways than one and the young men could "wash their spears" in blood. At the time that Zwangendaba crossed the Zambezi River, the ruling house consisted of Zwangendaba and his younger brother Ntabeni, representing the house of Hlachwayo, and the right-hand house consisted of Mgayi, son of' Mafu, and Mhalure, representing Mafu (that is, another son although fathered in levirate by Ntengo of the Nkosi clan). While settled in the baRozvi country near Thaba-si-ka-Mambo in about 1833, there was born to Zwangendaba by a wife named Soseya, a son called Ntutu, who was carried across the Zambezi river on the back of his mother. Ntutu was the eldest son of Zwangendaba, but not the son of the great wife. On entering the Nsenga country north of the Zambezi river, Zwangendaba settled near the village of Mkoko, the ancestor of the present chief Matonje, near the headwaters of the Nyimba Stream which enters the Luangwa River and which is now in the Petauke District of Zambia. Here he rested about five years, and here were born many of the chiefs who were later to become great names among the aNgoni peoples. From the aNsenga Zwangendaba learnt the use of the poison ordeal with the use of muabvi, the poisonous bark of the tree Erythrophloem guineense, used as a test of guilt or innocence. Into the tribe also were incorporated the aNsenga singanga or "witch- doctors". The aNgoni custom and discipline were altering. Already the young men were getting completely out of hand. In the aNsenga country the custom of circumcision died out, for the young men were cohabiting with aNsenga women before the time for their initiation and the age for circumcision. Far to the south, the custom of circumcision had already, by 1833 as reported by Gardiner in that year, died out as the result of refusal by Shaka himself to be circumcised. In the country of the aNsenga, Zwangendaba began to replace his losses in cattle, capturing the small hump-backed cattle of the aMaravi tribes, of which the aNsenga are one. He incorporated also large numbers of aNsenga men and women into the aNgoni tribe, and one such captive, Chiwere by name, risen to high position in the regiments of the aNgoni and granted the right to adopt the baSuto clan name of Ndhlovu, was later to break away from the aNgoni and carry war, as a leader of Nsenga-born regiments to their kin in Malawi. Mundikula, the first aNsenga chief to hold the title of Kalindawalu, was chief of the aNsenga at the time that Zwangendaba was settled at Mkoko. In 1840 or 1841, leaving Mkoko, Zwangendaba moved on again, travelling north along the eastern side of the Luangwa River watershed, until he reached the country of the aChewa chief Culu who was then living on the banks of the Rukuru River, near where the road from Mzimba to Lundazi now crosses the Rukuru River, just north of the Lundazi River and the Chimaliro Hills. Here, in the country the aNgoni called Maculu, the aNgoni settled among the aTumbuka and their aChewa overlords. The aTumbuka were a disorganised and scattered people who acknowledged no central chiefs, and who lived in small and scattered villages of little more than family groups. The aChewa of Culu, a branch of the aMaravi tribe, had settled among and dominated these aTumbuka without difficulty. These people were no match for the aNgoni, and they submitted tamely and laboured in their fields to supply the needs of their a Ngoni conquerers. Kanigna, Mwase Kasungu V, was at this period the reigning Mwase of Kasungu. From Maculu, the regiments of Zwangendaba, led by the nduna Makonjo, Mjeru, Mkomwiso and others devastated the countries of the aChewa chiefs Culu to the south and Gebisa to the west on the Luangwa River, and raided far into the Kasungu country. Here at Maculu, at the place called Mawiri where there are pools in the Rukuru River, was born to the head wife, Mnene, of Zwangendaba, a son named M’mbelwa. At about the same time, another wife of Zwangendaba, Chibenya, gave birth to a son Mabilabo. While settled at Mawiri, Zwangendaba began to feel old age approaching, and he suffered from rheumatism, and it was then it was said of him "let us get on to the country where there are red cattle, and you will have these for meat at my death". Before moving, he decided to do away with the aNsenga sing'anga who had accompanied him from Mkoko, and whose pretensions and falsehoods were annoying him, and he ordered them all to be put to death. Leaving Mawiri in about 1842 or 1843, the Angoni moved fast past Sorora Hill on the lower Mzimba River, past Tumba Hill north of the Luvevya Stream, then west over the Rukuru River, and then north again up the Ruwewe Valley and thus to the Vwaza Marsh, that is, along the line of the hills on the watershed between Lake Malawi and the Luangwa River, and passing west of Nkhamanga. They moved straight on without halting until they reached the high country east of the south end of Lake Tanganyika, and here, at a place they named Mapupu-the dreams-they settled among the waSukuma tribe near Fipa. At Mapupu, the aNgoni settled down happily to raid round both sides of Lake Tanganyika and south east to the country of the aNkonde, aNyakyusa, waSafwa and the many other tribes inhabiting the high mountains round the north end of Lake Malawi. It is said to have been west of Lake Tanganyika that the aNgoni found the long-horned cattle which were later to be known as "M’mbelwa's cattle" and which formed the royal herd of M’mbelwa, the punishment for possession of such cattle by other than M’mbelwa being death. These cattle have now interbred with the short-horned aMaravi cattle and the long-horned breed as such no longer exists. At Mapupu, at some date between 1845 and 1848, Zwangendaba died. Before his death he is said to have prophesied that his successors would see the coming of white men and the wane of the aNgoni power. The clan name of Zwangendaba was Jere. It is not an amaLala or abeNguni clan name, neither Zulu, Swazi nor Xhosa nor that of any of the conquered tribes. It is unlikely that the name Jere was used before the Zambezi crossing. Some authorities believe that the Maseko family of Mputa which was left behind on the south bank of the Zambezi River and crossed later and moved round the east side of Lake Nyasa, used the clan name of Jere, although they do not use it now, and the name is not known in the present-day division of the aNgoni of Ngomane, the descendant of Mputa. Zwangendaba was originally of the Nxumalo clan. How or why he assumed the clan name of Jele is not known. Some authorities believe it is derived from "kwa jele"-the great place. Others believe it is a corruption of thole-a calf. Yet others attribute it to the expression said to have been used by Zwangendaba as he watched his host fording the Zambezi River, "ningu jele, ningu jele"-we are many, we are many. Originally the clan name was Jele, for the Zulu peoples do not use the letter R, but it has been corrupted through the aNgoni adoption of the aTumbuka speech to Jere. Mnene, the great wife of Zwangendaba, of Ekwendeni Village, gave birth to M’mbelwa at Mawiri in about 1841. Soseya, of Loangweni Village, gave birth to Ntutu (later called Mpezeni) at Thaba-si-ka-Mambo in about 1833. Chutu, of Ekwendeni Village, gave birth to Mtwalo at Mkoko in about 1838. Mkumhlane, of Emcisweni Village, gave birth to Mpherembe at Mkoko between 1836 and 1840. Chiwambati, of Emanyareni Village, gave birth to Ndawasake at Mkoko between 1836 and 1838. Chibenya, of Elangeni Village, gave birth to Mabilabo at Mawiri in about 1841. Mambiti, of Embangweni Village, had no sons during the lifetime of Zwangendaba, but after his death she was married in levirate to Mahruli Nkosi, who took over all the wives of Zwangendaba, and by him she bore a son Mzukuzuku, known as Majelemafu. The isithakazelo of Zwangendaba was Pakati, the same as that of Zwide of the amaNdwande. Before his death, Zwangendaba named the house which was to succeed him, and he named Lomagazi Jele, the daughter of Mnene and sister of M’mbelwa, and thereby named M’mbelwa to succeed him. None of Zwangendaba's sons had reached manhood, and Ntabeni Jele, a brother of Zwangendaba, attempted to assume overall command of the army, but so also did Mgayi Jele, the eldest son of Mafu, and a full cousin of Zwangendaba. The warriors would support the move of neither, since it in fact meant an attempt to seize the chieftainship. Ntabeni had quarrelled seriously with Mnene, the great wife of Zwangendaba, and as much to spite her as for any other reason, he then nominated Ntutu, who was the eldest son of Zwangendaba and then aged about fourteen or fifteen years of age, for the chieftainship. He was so far successful that Ntutu was actually recognised as chief, for he had just reached puberty, whereas the other sons were still no more than children. The widows of Zwangendaba, who had been inherited in levirate by Ntabeni, were furious that Zwangendaba's instructions should be so ignored, and they deserted in a body to Mgayi Jele. This could lead to only one result-a complete break-up of the tribe. Gwaza, the chief councillor of the tribe and a Jele not in the line- of succession, threw all his influence against Ntabeni and his nominee Ntutu, and thereby united the opposition under Mgayi, and prevented a further breakup, and for a time there was a sullen truce. Shortly after this, Ntabeni fell ill, and, feeling he was dying, gave orders that no word of his illness was to be sent to Mgayi and that, should he die, only after his burial was Mgayi to be told of his death. Such a mortal insult could have only one result, and could only be wiped out in blood. Ntabeni died and his orders were carried out, and, as Ntabeni had predicted, Mgayi set his regiments in motion to wipe out the insult. The result was the first great split in the tribe. The bulk of Ntabeni's forces did not wait for Mgayi but fled to the south west where they fell upon the waNyamwezi and raided round the south west Mtwalo then assumed the chieftainship, and held together by the old and influential nduna Siwelewele, son of Ndhlovu, in an uneasy confederation the brothers moved off towards the south cast. Mpezeni refused to accompany them, and moving off accompanied by their half brother Mpherembe, he travelled down towards the south west. Mtwalo with his brothers M’mbelwa, Ndawasake, and Mabilabo all moved south east together, away from a famine that was then ravaging Ufipa. At about this time, Mzukuzuku was born, son of Mahruli Nkosi who had taken over the wives of Zwangendaba after the death of Ntabeni. Travelling south east the brothers settled at a place they called Cidhlodhlo, somewhere north of Lake Malawi. Ahead of them had fled an nduna named Zulu Gama, who had quarrelled with M’mbelwa and had fled away from his anger. Zulu Gama had travelled the same route as the brothers later followed but went further until he met the aNgoni of Mputa Maseko who were settled round Songea and who had broken away from Zwangendaba at the Zambezi crossing, after they had failed to cross with Zwangendaba. Zulu Gama allied himself with Mputa Maseko and settled down among his aNgoni. The brothers had been but a short while at Cidhlodhlo when they clashed with the amaMungwala of Mputa Maseka, who were aided by the regiments of Zulu Gama, and, at Lumbira, near the north east end of Lake Malawi, were signally defeated by them and immediately retreated. They knew the country to the north and west. They remembered the timid aTumbuka peoples to the south, and the wide and fertile pastures of the Kasitu Valley which their foraging bands had raided while they were at Mawiri, and so they moved south. Zulu Gama was a commander of regiments with considerable personality and ambition. To repeat again the Zulu saying, he had found "he could rear no calves" with the sons of Zwangendaba, and had accordingly attached himself to the semi-aNgoni of Mungwala or Mputa, the maKaranga or baRozvi leader of the lost Zambezi rearguard which was largely composed of tribes incorporated into the aNgoni tribe. Soon after the defeat of the brothers, Mputa died and was succeeded by his son Chidyaonga. This was the chance for Zulu Gama, who immediately revolted and set about dealing with the amaMungwala, and in short order defeated and drove side of Lake Tanganyika. They took the name of Ntutu whom they had supported and calling themselves amaMtutu, soon corrupted to waTutu, they settled about fifty miles south of the south end of Lake Tanganyika, where Dr. Livingstone recorded their presence in 1867 as an already decaying tribe. Others fled to the north and penetrated as far as the southern shores of Lake Victoria Nyanza where Stanley found them in 1871 known to the surrounding tribes as maViti-the terrible ones. He wrote of them "no traveller has yet become acquainted with a wilder race in Equatorial Africa than that of the Maviti or Watuta, for their hands are against every man's and every man's hand appears to be against them". In 1879, Mr. Stewart heard of these waTuta or ma Viti in the same locality. But not all of them fled. As Ntabeni had arranged, a small and select band of warriors waited in hiding for Mgayi to move. Mgayi, with his massed regiments raced after the fleeing amaTutu, and, waiting until Mgayi was well out of the way, the band in hiding fell upon the defenceless villages of Mgayi, looting and ravaging the unguarded settlements, and killing or capturing most of Mgayi's wives and children, and then they also fled to rejoin their companions. Messengers called back Mgayi with the news to Emankechezeni, his looted village, and returning without meeting the fleeing amaTutu, Mgayi found that of all his children, only one small son, Mtenji, was still alive, for he had been out in the bush with his mother when the raid occurred. Shortly after this, Mgayi died, and having no grown sons or brothers to succeed him, power passed to the sons of Zwangendaba. These sons were all youths or children. There was no senior member of the family to unite them. The brothers asked Mtutu, the eldest and the first to reach puberty, to lead them to a better land. They did not offer him the chiefdom. He claimed chiefdom over all of them because he was the eldest. M’mbelwa contested this on the grounds that he was the nominated heir. Mtwalo also claimed the chieftainship on the grounds that he was older than M’mbelwa. In this atmosphere of jealousy, intrigue and suspicion, Mtutu, or, as he was now known, Mpezeni, assumed the chieftainship and moved off to the south west, and was immediately met with revolt and was deposed. them out, and established himself as chief in the neighbourhood of Songea in what is now Tanzania. Chidyaonga fled to the south down along the high country west of Lake Malawi. By some accounts, he turned first east and reached to near the Indian Ocean and then turned back again to the south west. Eventually he settled to the east of Mlanje Mountain in what is now Portuguese East Africa, and in about 1868 or 1869, crossed the Shire River and moved up to Domwe Mountain where he had in about 1836 rested for a while, and here he settled. Meanwhile, Mpezeni and Mpherembe had moved to the west, but they soon met the aBemba or a Wemba, a people not panic stricken at the name and sight of the aNgoni and moreover armed with guns they had traded from the coast, and in about 1856 they were repulsed and swung south along the borders of the aBemba country. At this time, the aNgoni brothers under the doubtful leadership of Mtwalo were also moving south, but further to the east and the other side of the Luangwa Valley. Mpherembe had an uneasy partnership with Mpezeni and decided to stay awhile in the country of the aMambwe on the fringe of the aBemba country. Here, Mpherembe was friendly with Mwamba, but after a few years during which there were a series of small disagreements culminating eventually in fighting, Mpherembe was worsted and was forced to leave. Turning east, he decided to rejoin his brothers, and in due course reached M’mbelwa just after he had left Choma Mountain and had settled at Enchisweni. This sojourn of Mpherembe among the aMambwe was reflected in some of the arts and customs of Mpherembe's people for some time thereafter, and until the time of his death, Mpherembe retained friendly relations with Mwamba, notwithstanding their former disagreements, but with Chitimukulu, chief of the aBemba, Mpherembe remained at bitter enmity. Meanwhile, Mpezeni alone, moving south, attacked the baBisa and a Lala as far as Lake Bangweolu, but pressed by the aBemba on the north west and the baNyeke on the west, be moved away to the south east, and after settling for a few years on the Muchinga escarpment west of the Luangwa Valley, he crossed the Luangwa River and attacked the aChewa chief Mbang'ombe and drove him into the hills where he invested him for some five years before Mbang'ombe capitulated. This was in 1865. Mpezeni then moved again then moved again and settled on the Matambazi Stream below Mpinduka Hill, and here, in the Nsenga country, the aNgoni of Mpezcni adopted the Nsenga language. It was while he settled here that Dr. David Livingstone passed through the Luangwa valley late in 1866 and found abundant evidence of the raids of Mpezeni both sides of the Luangwa River. Moving again son after 1870, Mpezeni settled on the headwaters of the Lutembwe and Msipazi Streams, from which he raided Mkanda, an aChewa chief, and placed his headmen in part of that country. In 1855, the band of brothers reached Nkhamanga in Malawi. Mtwalo had not proved a success as a chief. He was weak and pusillanimous, and his puberty had been greatly delayed. He had by custom many wives but he was impotent and could not please them. In 1855 he resigned his claims to the chieftainship, and in that year, at Ng’onga in Henga Valley, M’mbelwa was elected chief of aNgoni, and, before his people, straddled a captured leopard as a symbol of his power. As Zwangendaba had predicted, all his sons were to see white men and the decline of the aNgoni power. Mtwalo died in 1891. In 1882 Dr. Laws described him as a handsome, intelligent man. M’mbelwa, described as a short corpulent man with shrewd face, died in 1891. Mzukuzuku died on 15th June, 1908. Mpherembe died on 1st September, 1909. Ndawasake died at a date unknown but before 1890. Hoahoa who had been nduna of M’mbelwa died in June, 1908. 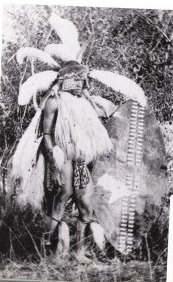 Ng’onomo, M’mbelwa’s chief fighting captain, died in September, 1907. Mtwalo, M’mbelwa and Ndawasake were not destined to see European Government in their country, but they were to live long enough to meet and respect the Scots missionaries led by Dr. Robert Laws. Far to the south, Mzilikazi, chief of the amaNdebele, had fled north from Transvaal and settled in what is now known as Matabeleland. On his death in 1858, he was succeeded as chief by Lobengula after he had overcome the supporters of the rightful heir in pitched battle. At the time when missionary pioneers were entering Malawi in increasing numbers, so also missionaries, hunters, explorers, prospectors and concession hunters in increasing numbers were entering the country of Lobengula. He was finding it harder and harder to keep his young regiments in check, and remembering Mzilikazi's bitter lessons at the hands of the Boer horsemen, he realised that his impatient regiments were no match for armed horsemen, and that a single injudicious attack by his regiments or another trek by the Boers might well precipitate another day as terrible as that day in late 1837 when Boer horsemen hunted the amaNdebele all day like game, and he decided to move north and follow Zwangendaba. In the late 1880's he set about securing sufficient canoes for the crossing of the Zambezi River, and was on the brink of making final preparations for the exodus, when the entry in 1890 of the Pioneer Column into what is now known as Mashonaland, cut off his path to the north. Three years later, in 1893, in what is called the Matabele War, the defeated Lobengula fled north with a small bodyguard. It is generally accepted that he died on the way, after travelling only a short distance, in Matabeleland, but it is worth remark that the aNgoni have a tradition that Lobengula did reach and cross the Zambezi River with his wagons, and reached the hills in the vicinity of Sanjika, between Fort Manning and Fort Jameson, where he died and was buried in great secrecy and all evidence of his presence destroyed; lest Europeans come after his followers. The Nguni people identify and know each other by surnames and izithakazelo. The people who were captured, trained and assimilated into Zwangendaba's impi [warriors] were allowed to retain their surnames and traditions such as vimbuza and nyau dances. Preservation of their identity and origin. Remarkable just like the modern government systems. Thank you a million Mr. Samuel Kadyakale for all the research you always make. Keep it up brother......we all want our history on paper !! !